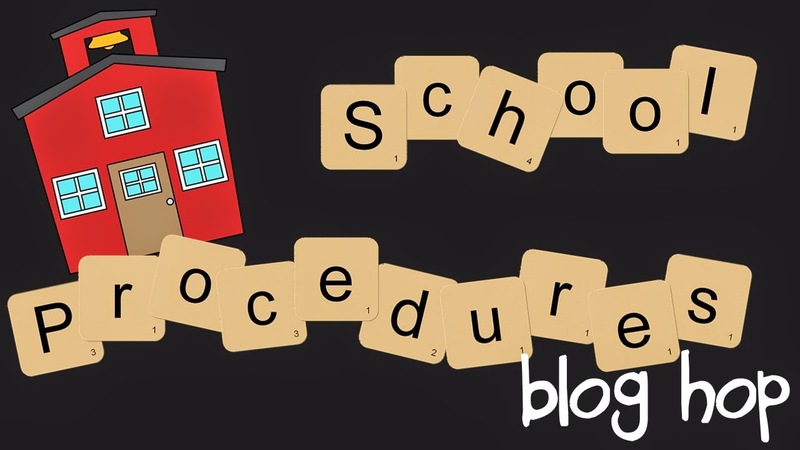 Setting up procedures that will run smoothly through the year can seem overwhelming! There are so many GREAT ideas out there. Our store is full of materials to help set up your space for great procedures that match many different themes. You have to find what works best for you and your students. We are going to share some that work well in our classes. As our kids come in the door we greet them with a hug, hand bump, handshake, or high five. Then the kids go into the room and know exactly what to do. They all graph their names on our "Yes/No" graph. We have a question that they answer yes or no under and when it is time to take attendance we can quickly look and see who is not here. We also can tie the question into what we are working on and talk about it during our mini-lesson as a "turn-and-talk" with our partners. After they graph their names they continue with their morning routines. 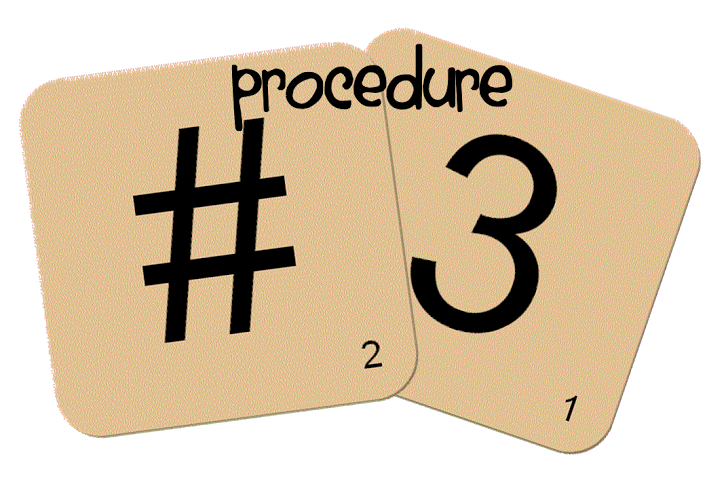 We have used this in Kinder, 1st, and 2nd grade, it has worked perfectly in all three! 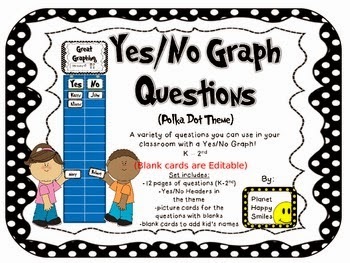 Click the picture below to get to one of our "Yes/No Graph Questions" in the black and white polka dot print or click here to get to a variety of different styles of the graph questions. We always take our class as a whole to the restroom before we go to P.E., Art, or Music. 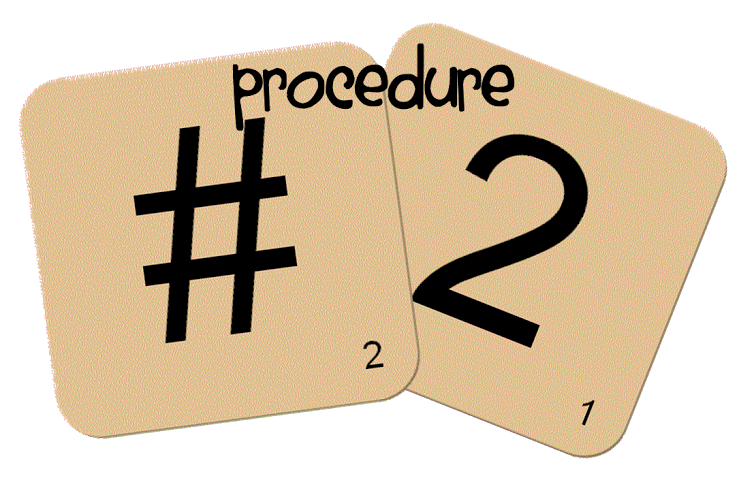 When they need to go during other times we have these procedures in place. 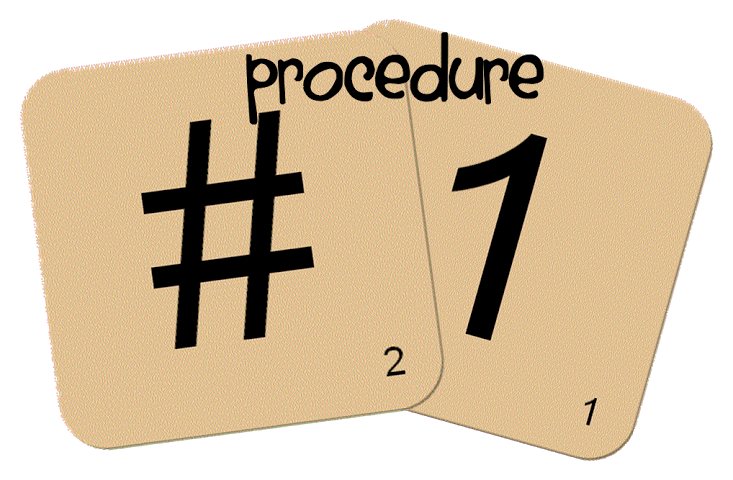 #1 Places around the building have their own designated pass to wear when leaving the room. Those around the building know where they are headed and where they came from. 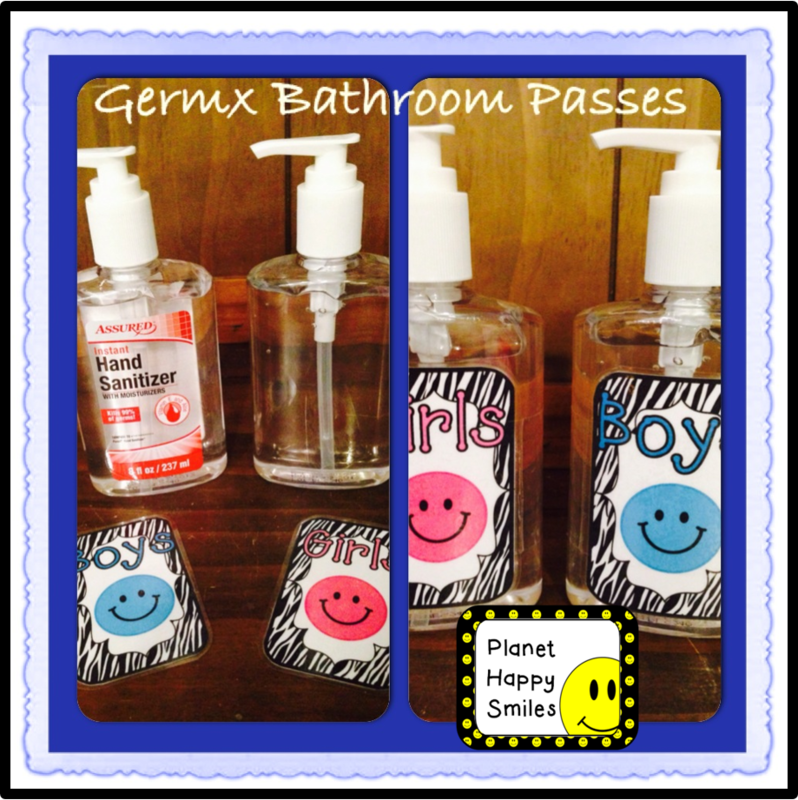 #2 When going to the restroom, they wear a pass and place the germx bottle on their table before leaving. That way you know who is out of the room and they germx when they return to make sure even the "non-washers" have clean hands. Here is our signature "happy face" passes. 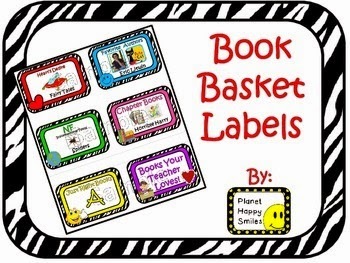 We have other passes that are designed for different themes. 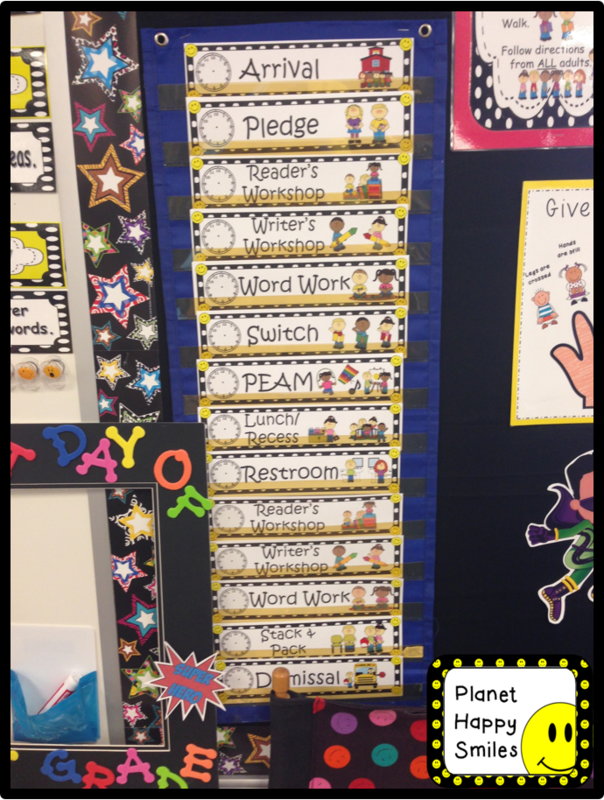 If you set up a place in the room or on your outside wall with clips, changing their work is a breeze! 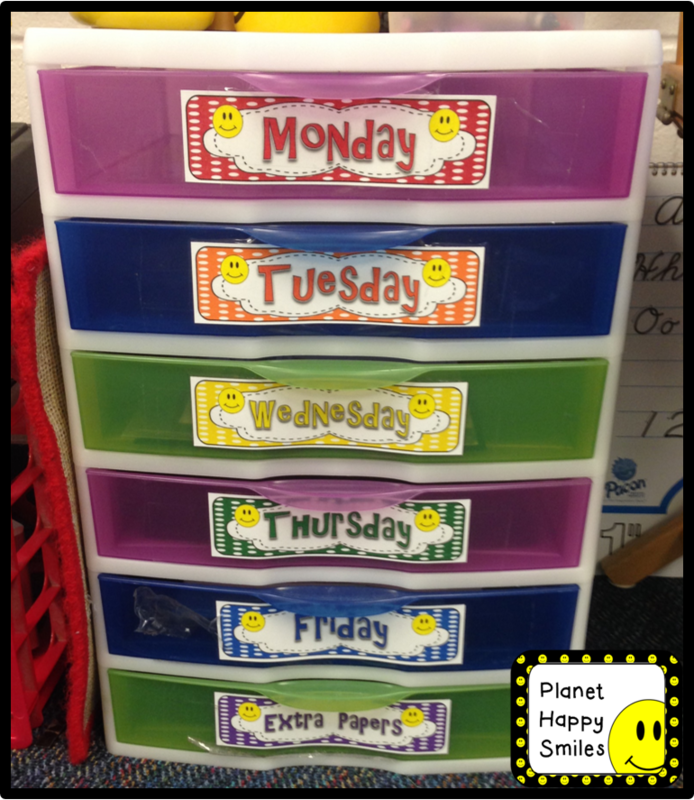 The clips also help keep their work looking nicer with no staple holes in it. It is a win-win! 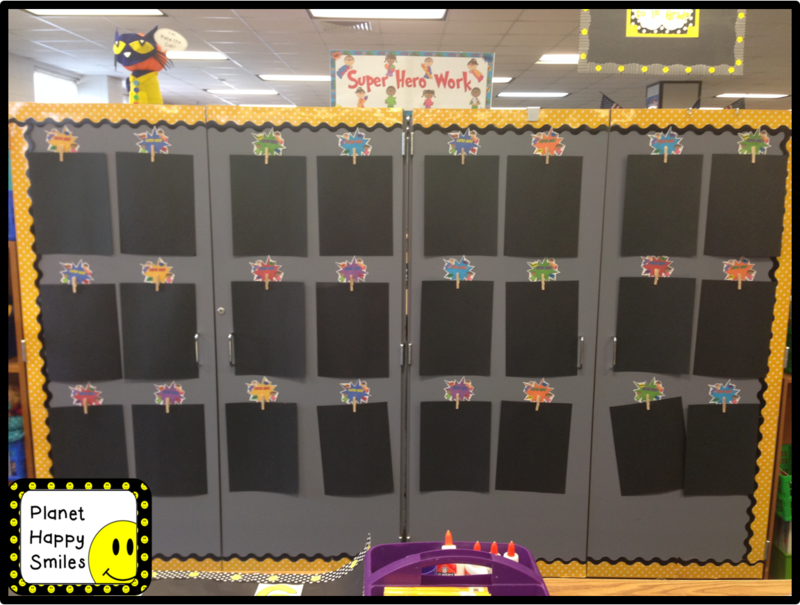 Here are a couple of ideas for displaying work. 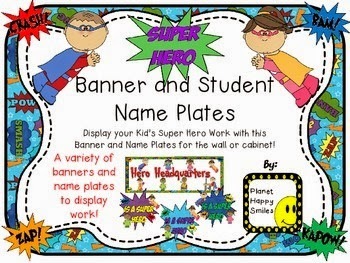 This one is in the hall and will have binder clips added to the top of each poster board frame. 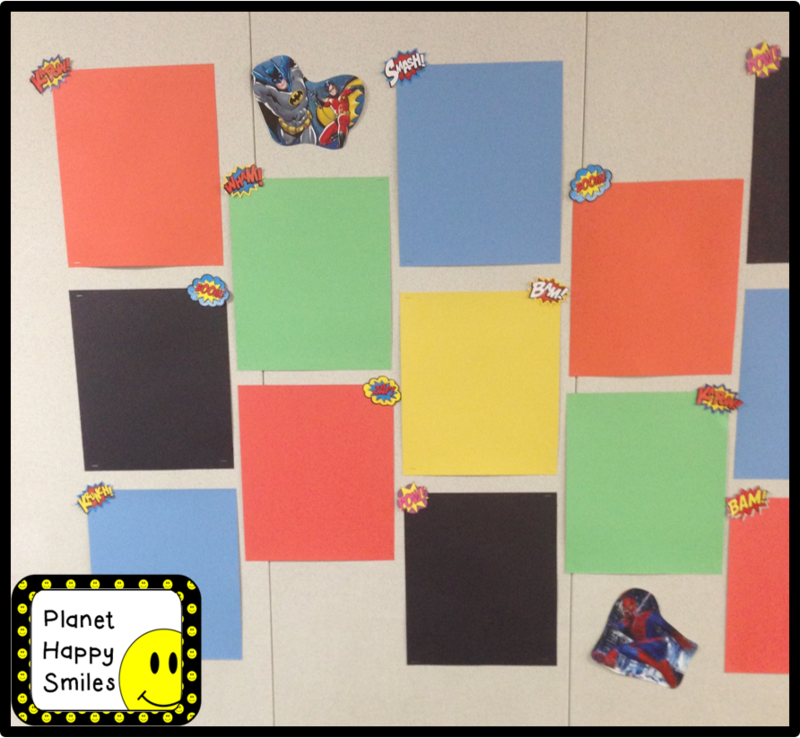 This is a bulletin board with the "Super Hero" theme in the classroom. Clips are holding black paper for two reasons: 1. To make sure they are spaced well. 2. To make it look a little less empty until the kid's work goes up! 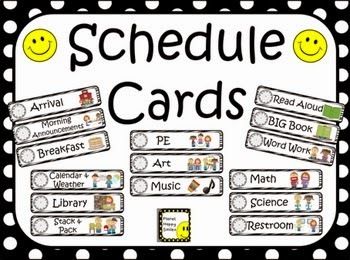 We are required to have a schedule chart up in our rooms, but it is very important to have! 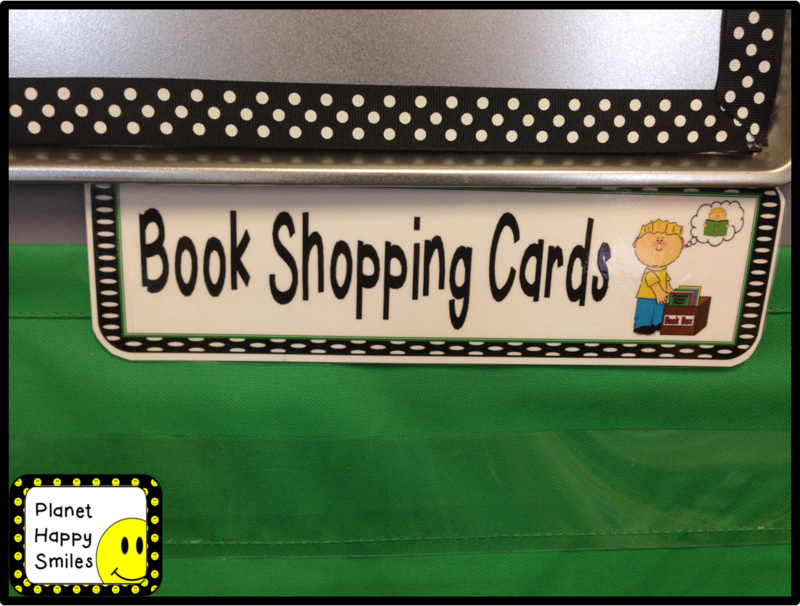 During the day we have children who will move the clip down to match the activity we are working on. 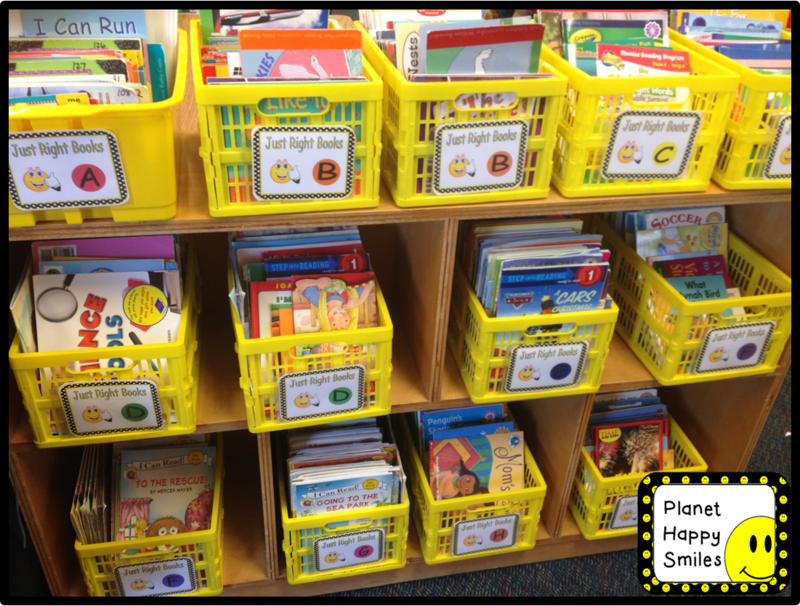 It really helps the children "Begin with the end in mind!" 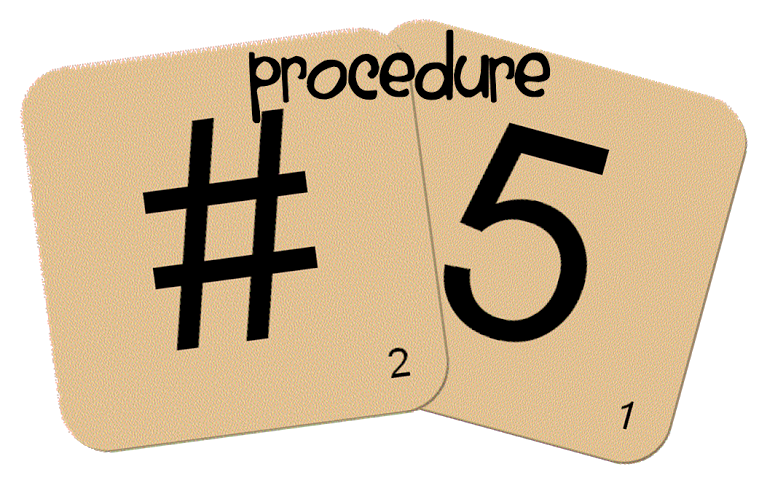 We also post our rules, rewards, consequences, "Give Me Five" cards, and L.E.A.D. cards on the same bulletin board. 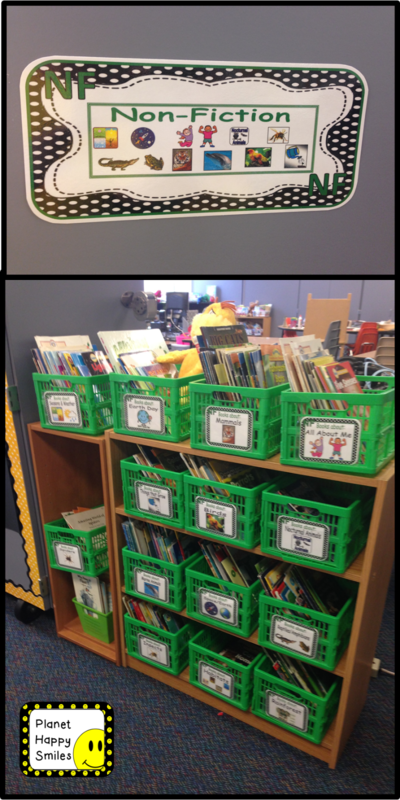 A well organized classroom library is a must! 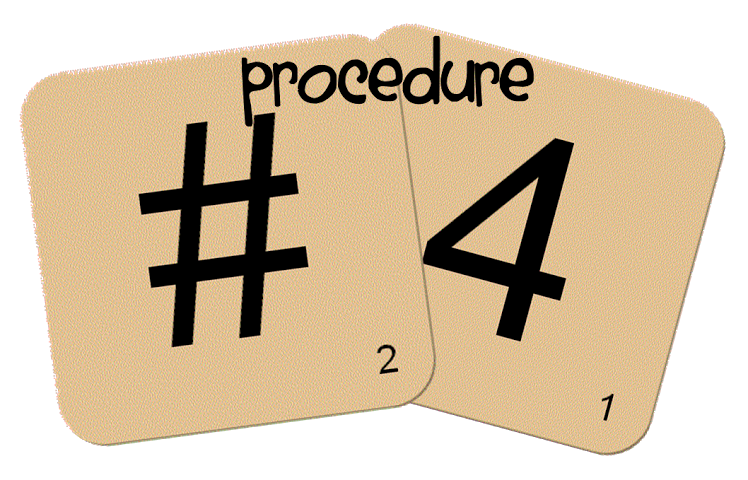 We used it daily, and setting up good procedures from the beginning are very important. 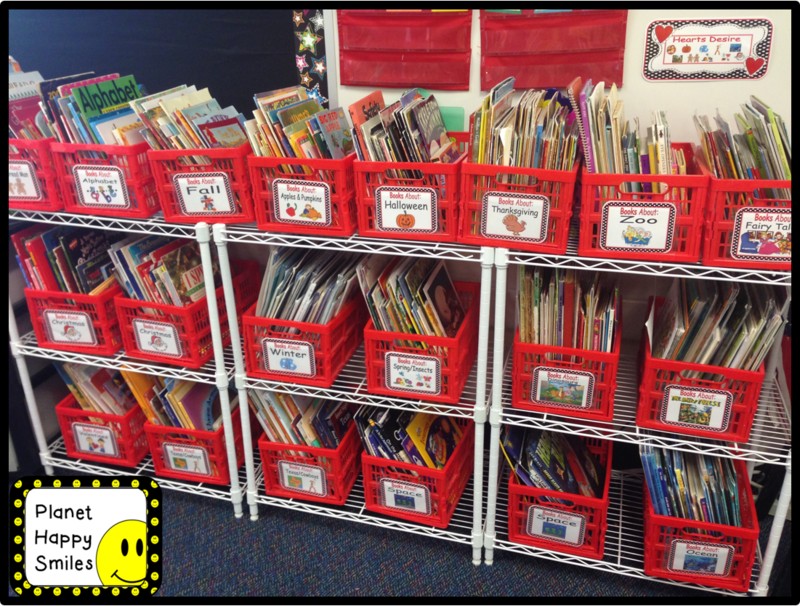 The students need to know where all of the books are located, how to check them out, and where to put them back when they are finished with them. If you train them from the beginning to put them back where they belong you will save yourself tons of time later. 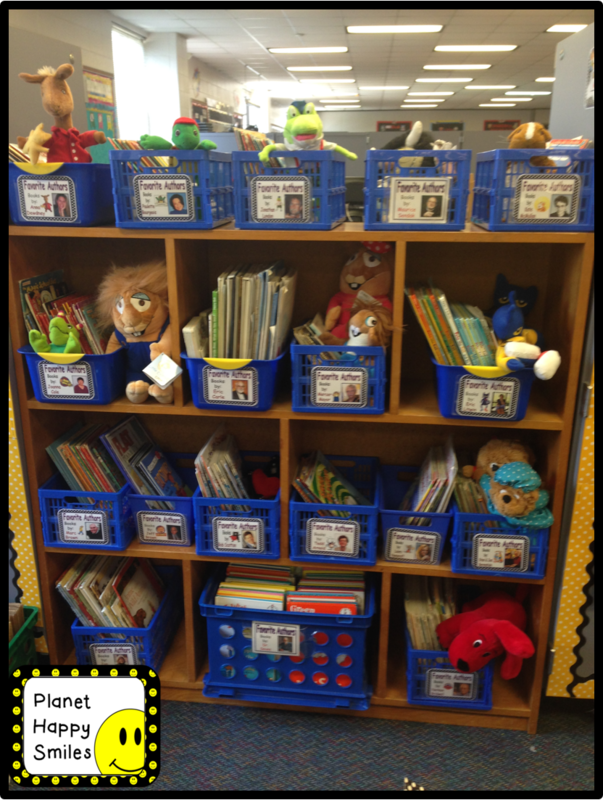 Also, some of your very organized students can be in charge of making sure everything is placed in the correct spots. Have a VERY Happy Beginning to your year! I love the idea of putting the sanitizer on the desk when a student leaves. What a simple fix to a common problem! 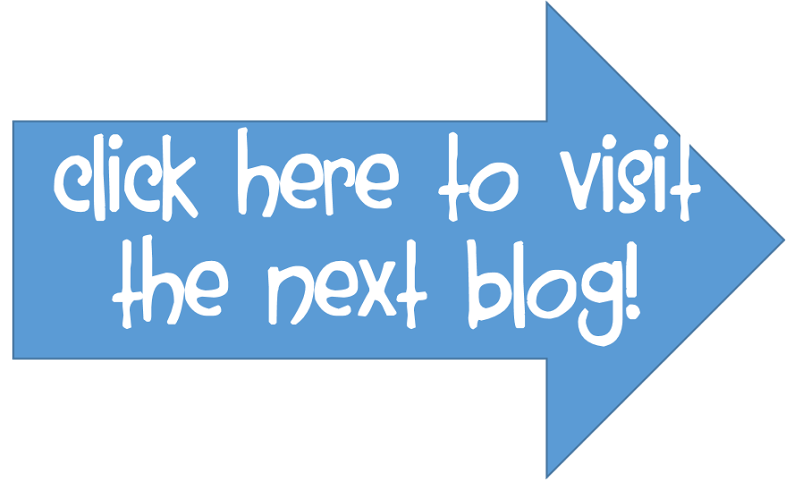 Thanks so much for joining the blog hop! Thanks, Crystal! We are having so much fun "Hopping Around!" The germx was a nice addition to my class. I like thinking that their hands are clean. So many kids walk out without washing their hands. Last year I did not have very many sick kiddos. I wonder if it helped? 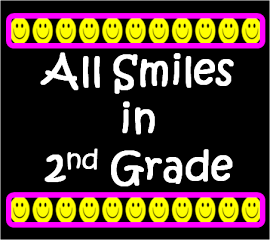 Have a terrific school year! Happy Teaching! Fantastic idea with the hand sanitizer! Thanks so much!!! We are thinking about adding it to our store soon.